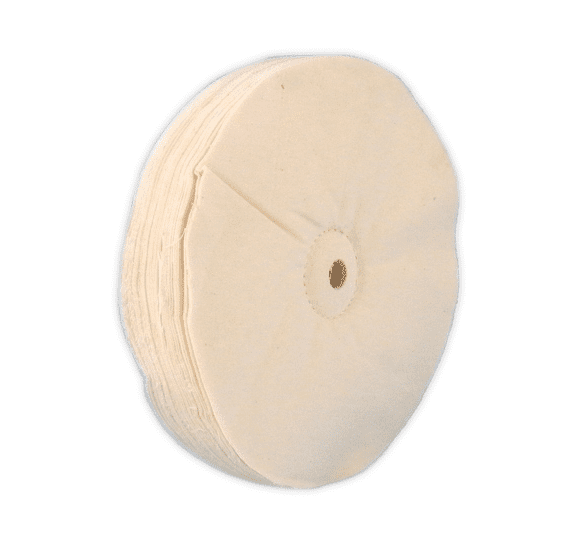 Our buffing wheels FAPI-BUFF are made of individual sheets of various cloth qualities. Due to this design, buffing wheels are also called loose, completely rounded polishing wheels. The cloth qualities are explained in the table below. The buffing wheel FAPI-BUFF ensures a perfectly polished surface. The buffing wheel FAPI-BUFF is used primarily for polishing and finishing of flat, lightly and strongly deformed workpieces. It is used when working by hand at a pedestal polisher, and also on automated polishers. They are ideal especially when pre-polishing, polishing and finishing flat and lightly deformed workpieces. For gentle cleaning of the running surface and/or for opening when clogged with polishing emulsion/paste we recommend our polishing disc dresser FAPI-PLANER! As for all cloth polishing wheels, the work is done by the roughened threads on the wheel’s perimeter. Because they are made from full rounded, loose single sheets, buffing wheels are not as aggressive as flap polishing wheels. This is an advantage when polishing small workpieces by hand because aggressive flap polishing wheels can cause injuries to the operator’s hands. Buffing wheels are mostly used when hand polishing these components.